$619.99 Seen a lower price? 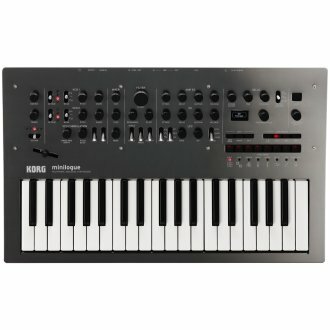 Korg's groundbreaking Minilogue is a fully programmable four-voice polyphonic analog synthesizer; complete with a 16-step polyphonic note and motion sequencer, arpeggiator, and delay. 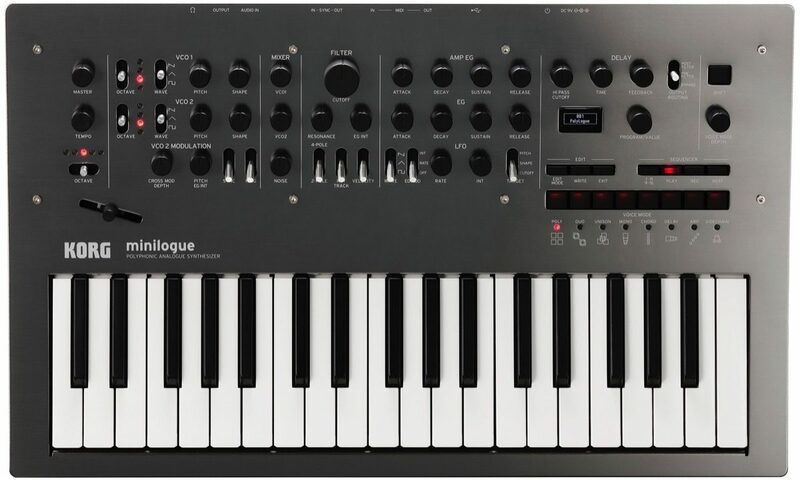 With its high-quality construction, rugged rubber-coated PCB-mounted knobs, and easy to understand signal flow, minilogue is designed to inspire and captivate musicians and analog enthusiasts on all levels. A new Voice Mode lets users choose how the four available voices are configured; from Polyphonic to Duophonic to Unison and beyond. In addition to offering up information on presets and editable parameters, the OLED display also features a real-time oscilloscope, providing functional and eye-catching visual feedback on the sound being played; a feature never before seen on a hardware synth. The inviting layout, uniquely curved sand-blasted aluminum panel and real Pyinkado wood back panel gives the roadworthy minilogue a standout look to complement its powerful and dynamic sound creation capabilities. - Four-voice, fully programmable polyphonic analog synth with presets and a powerful, flexible architecture for amazing versatility in sound creation and exploration. Voice Mode allows the user to configure voices: Polyphonic, Duopohonic, Monophonic, Chord, Unison, and more! - 16-step poly note and motion sequencer & tape-style delay (both savable per preset); OLED display with oscilloscope for educational and fun visuals of the sound being played. - Superior build and a fantastically standout new look featuring curved aluminum panel, rugged chassis-mounted metal shaft pots, rubber-coated knob and a solid pyinkado wood rear panel! - 200 editable preset locations with 100 preloaded. Available until 11 PM (EST) today. Mention special code 1ZZ-MNFN when you call.